Perfect for my grandson. So colorful and fun. This inviting and playful microfiber comforter set is finished in a unique tire tread stitching pattern, and for a versatile, multi-functional touch, it reverses to a super bright orange. Its medium lightweight construction makes it perfect for all year use. This monster truck themed comforter was perfect in my 2 year olds bedroom. The colors are very bright. The comforter is very soft and fluffy. Really glad I purchased this. Nice comforter. Great colors. Good quality. Looks great on the bed. Would recommend for your little monster truck enthusiast. My grandson loves it!! This was purchased as a gift for my grandson. 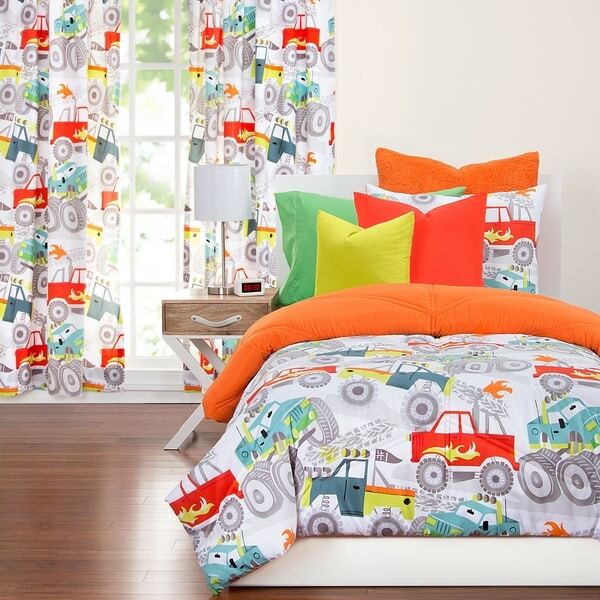 He loves monster trucks, so this comforter set was perfect for him. The colors are very vibrant and any young boy would love this. It is exactly as shown in the picture. It is nice and soft and looks just like new even after washing. I ordered for my grandson bedroom at my house. I think he is going to love them! I am so excited! I was looking for monster truck bedroom decor and needed the bedding to fit a queen size bed. Very cute, I would recommend to others!! Cute and seems to be good quality. I still feel like the price is very high for only getting a comforter and pillow sham. My son likes the print and it works in his room. But I’d be more comfortable if this was in the $40-50 price range. This is a very bright and fun looking comforter set. I bought if for my little boy's room and it looks fantastic. I would recommend if you are looking to brighten up the space. My son just loved this product. Not only are the colors vibrant the fabric is smooth and comfortable. Great product for a 3-4 year old. My son just loves it! Perfect for my 3 year olds monster truck themed room! Loved it!! Comforter is very soft and fits the bed perfect. My great nephew LOVES his comforter & constantly takes it off his bed to his toy room to play! Vibrant colors seemingly durable fabric yet not course or rough. No skimping on size .. good coverage. The colors are true to the picture. It is a nice comforter. My grandson is going to love his new bedroom when we get it finished! Definitely worth the look on his face! "where can o find the curtains for this set?" "Is there any navy blue color on this comforter? Wondering if it will go with my sons navy bed." Doing my Grandsons room in Monster trucks. "Where can I find the curtains for sale? I can’t find them on overstock website"
"IS THE COMFORTER WITH THIS SET SOFT?"